So far you have learned only obvious and mundane things. I know that taking the first step can be the hardest part of the journey, so I wanted to coddle you a little just to get you going. The coddling stops here. You must now understand the cold, hard truth of competition. This is the difficult part to accept. This is the part that will upset you. You will have many defense mechanisms that will tell you that I am wrong, but I assure you with certainty that on this point I am delivering divine truth directly to you. The derogatory term “scrub” means several different things. One definition is someone (especially a game player) who is not good at something (especially a game). By this definition, we all start out as scrubs, and there is certainly no shame in that. I mean the term differently, though. A scrub is a player who is handicapped by self-imposed rules that the game knows nothing about. A scrub does not play to win. Now, everyone begins as a poor player—it takes time to learn a game to get to a point where you know what you’re doing. 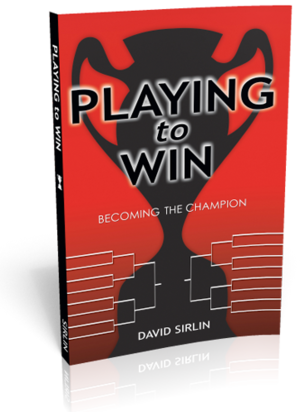 There is the mistaken notion, though, that by merely continuing to play or “learn” the game, one can become a top player. In reality, the “scrub” has many more mental obstacles to overcome than anything actually going on during the game. The scrub has lost the game even before it starts. He’s lost the game even before deciding which game to play. His problem? He does not play to win. The scrub would take great issue with this statement for he usually believes that he is playing to win, but he is bound up by an intricate construct of fictitious rules that prevents him from ever truly competing. These made-up rules vary from game to game, of course, but their character remains constant. Let’s take a fighting game off of which I’ve made my gaming career: Street Fighter. In Street Fighter, the scrub labels a wide variety of tactics and situations “cheap.” This “cheapness” is truly the mantra of the scrub. Performing a throw on someone is often called cheap. A throw is a special kind of move that grabs an opponent and damages him, even when the opponent is defending against all other kinds of attacks. The entire purpose of the throw is to be able to damage an opponent who sits and blocks and doesn’t attack. As far as the game is concerned, throwing is an integral part of the design—it’s meant to be there—yet the scrub has constructed his own set of principles in his mind that state he should be totally impervious to all attacks while blocking. The scrub thinks of blocking as a kind of magic shield that will protect him indefinitely. Why? Exploring the reasoning is futile since the notion is ridiculous from the start. You will not see a classic scrub throw his opponent five times in a row. But why not? What if doing so is strategically the sequence of moves that optimizes his chances of winning? Here we’ve encountered our first clash: the scrub is only willing to play to win within his own made-up mental set of rules. These rules can be staggeringly arbitrary. If you beat a scrub by throwing projectile attacks at him, keeping your distance and preventing him from getting near you—that’s cheap. If you throw him repeatedly, that’s cheap, too. We’ve covered that one. If you block for fifty seconds doing no moves, that’s cheap. Nearly anything you do that ends up making you win is a prime candidate for being called cheap. Street Fighter was just one example; I could have picked any competitive game at all. Doing one move or sequence over and over and over is a tactic close to my heart that often elicits the call of the scrub. This goes right to the heart of the matter: why can the scrub not defeat something so obvious and telegraphed as a single move done over and over? Is he such a poor player that he can’t counter that move? And if the move is, for whatever reason, extremely difficult to counter, then wouldn’t I be a fool for not using that move? The first step in becoming a top player is the realization that playing to win means doing whatever most increases your chances of winning. That is true by definition of playing to win. The game knows no rules of “honor” or of “cheapness.” The game only knows winning and losing. A common call of the scrub is to cry that the kind of play in which one tries to win at all costs is “boring” or “not fun.” Who knows what objective the scrub has, but we know his objective is not truly to win. Yours is. Your objective is good and right and true, and let no one tell you otherwise. You have the power to dispatch those who would tell you otherwise, anyway. Simply beat them. Let’s consider two groups of players: a group of good players and a group of scrubs. The scrubs will play “for fun” and not explore the extremities of the game. They won’t find the most effective tactics and abuse them mercilessly. The good players will. The good players will find incredibly overpowering tactics and patterns. As they play the game more, they’ll be forced to find counters to those tactics. The vast majority of tactics that at first appear unbeatable end up having counters, though they are often quite subtle and difficult to discover. Knowing the counter tactic prevents the other player from using his tactic, but he can then use a counter to your counter. You are now afraid to use your counter and the opponent can go back to sneaking in the original overpowering tactic. This concept will be covered in much more detail later. The good players are reaching higher and higher levels of play. They found the “cheap stuff” and abused it. They know how to stop the cheap stuff. They know how to stop the other guy from stopping it so they can keep doing it. And as is quite common in competitive games, many new tactics will later be discovered that make the original cheap tactic look wholesome and fair. Often in fighting games, one character will have something so good it’s unfair. Fine, let him have that. As time goes on, it will be discovered that other characters have even more powerful and unfair tactics. Each player will attempt to steer the game in the direction of his own advantages, much how grandmaster chess players attempt to steer opponents into situations in which their opponents are weak. Can you imagine what will happen when the two groups of players meet? The experts will absolutely destroy the scrubs with any number of tactics they’ve either never seen or never been truly forced to counter. This is because the scrubs have not been playing the same game. The experts were playing the actual game while the scrubs were playing their own homemade variant with restricting, unwritten rules. I once played a scrub who was actually quite good. That is, he knew the rules of the game well, he knew the character matchups well, and he knew what to do in most situations. But his web of mental rules kept him from truly playing to win. He cried cheap as I beat him with “no skill moves” while he performed many difficult dragon punches. He cried cheap when I threw him five times in a row asking, “Is that all you know how to do? Throw?” I gave him the best advice he could ever hear. I told him, “Play to win, not to do ‘difficult moves.’” This was a big moment in that scrub’s life. He could either ignore his losses and continue living in his mental prison or analyze why he lost, shed his rules, and reach the next level of play. I’ve never been to a tournament where there was a prize for the winner and another prize for the player who did many difficult moves. I’ve also never seen a prize for a player who played “in an innovative way.” (Though chess tournaments do sometimes have prizes for “brilliancies,” moves that are strokes of genius.) Many scrubs have strong ties to “innovation.” They say, “That guy didn’t do anything new, so he is no good.” Or “person X invented that technique and person Y just stole it.” Well, person Y might be one hundred times better than person X, but that doesn’t seem to matter to the scrub. When person Y wins the tournament and person X is a forgotten footnote, what will the scrub say? That person Y has “no skill” of course. You can gain some standing in a gaming community by playing in an innovative way, but that should not be the ultimate goal. Innovation is merely one of many tools that may or may not help you reach victory. The goal is to play as excellently as possible. The goal is to win.